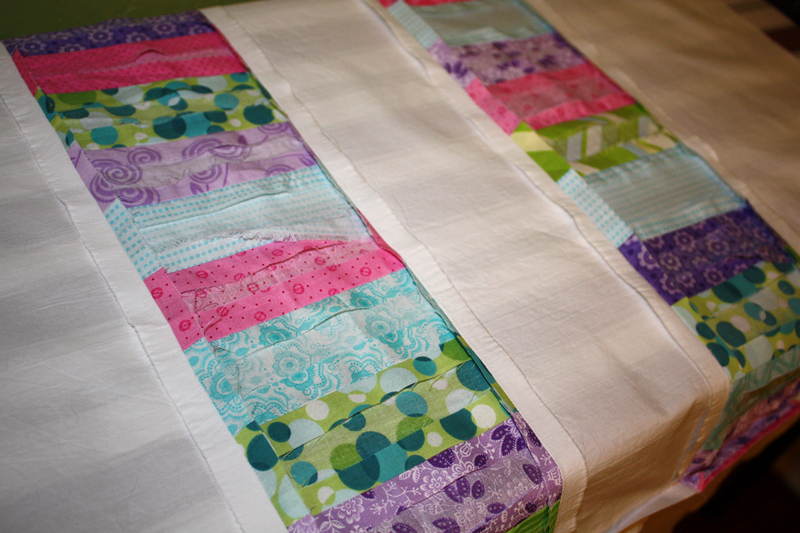 To get started I washed all the fabric and then cut the fabric into 2.5 inch strips and sewed them together along the long edge. 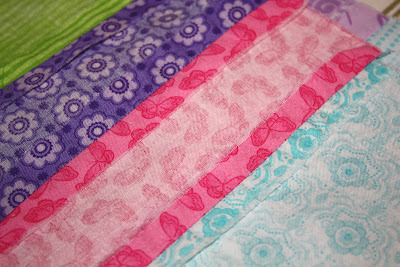 I initially sewed four strips together of each color then cut the width of the strips to 6 inches wide. These pieces I randomly mixed until I had segments in the length I wanted. 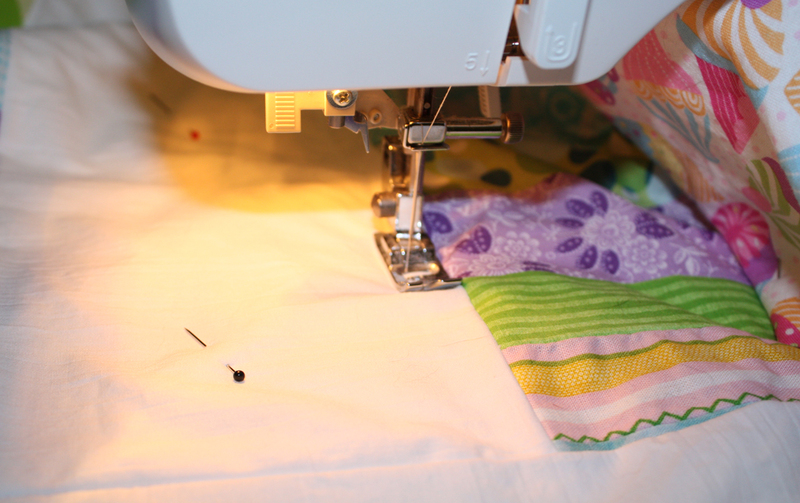 I wasn't too worried about everything being perfectly uniformed, I wanted it to have a little character and being a new sewer my seams weren't always straight! 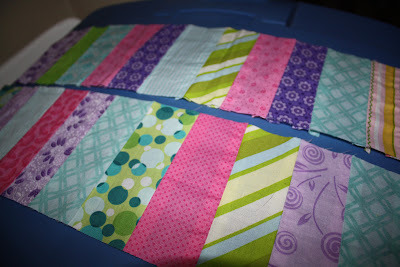 Next I cut white fabric in 6 inch widths to the same length of my colored fabric segments. 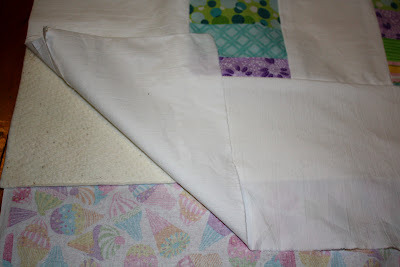 I had three colored fabric segments so I cut 4 pieces of the white fabric to go the length of the quilt (along the long edges and between the colored segments) and also 2 pieces to go across the top and bottom of the quilt. I sewed all these pieces together and then ironed the seams open. 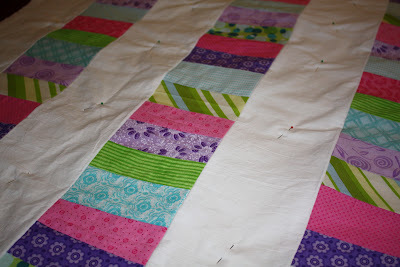 I then pinned all the layers together so they would not shift during the quilting step. I wasn't ready to try my hand at free-form quilting to make the neat swirly pattern so I decided to do rectangles in the white segments of the quilt. 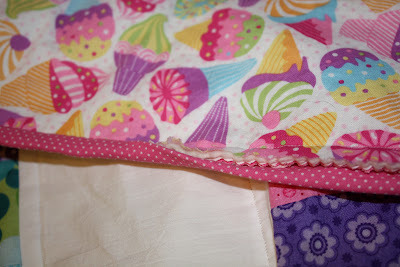 To make it even easier I made the stitch a sewing foot distance from the colored strips instead of trying to match the seam perfectly. The next step I was a bit worried about because I couldn't quite picture how to do the hand stitch for the back of the quilt binding. 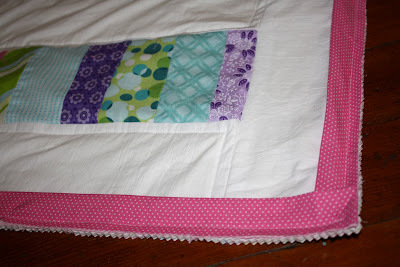 I decided I would give it a try since it would give the quilt a nice finished look. 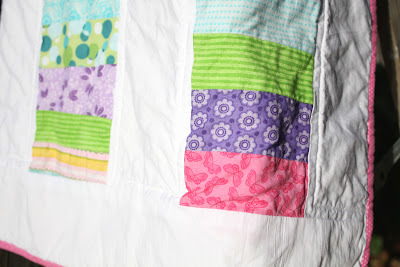 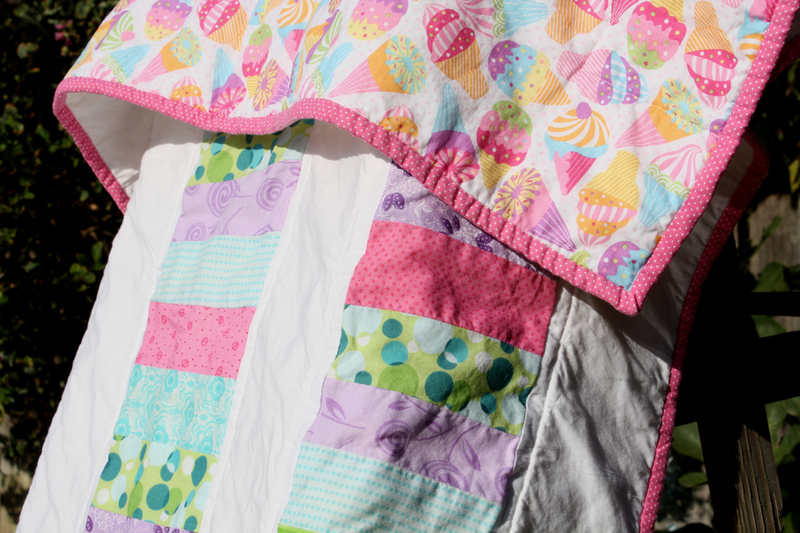 I followed the tutorial on Crazy Mom Quilts and I figured it out with her detailed directions! 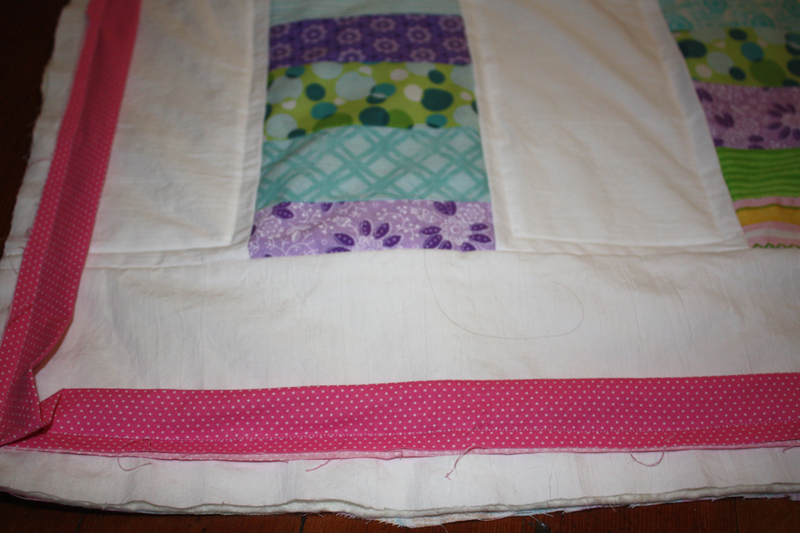 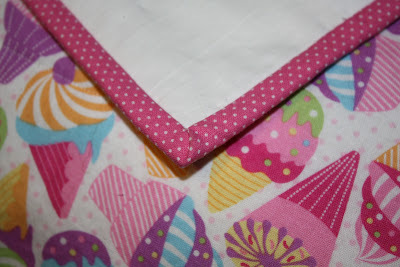 First I sewed the length of the binding strip I would need from a pink pin dot fabric in 2.5 inches wide. 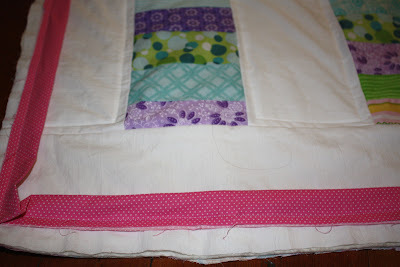 I then ironed the binding strip in half. Then I pinned it around the edge of the front side of the quilt with the open edge of the binding towards the edge of the quilt. 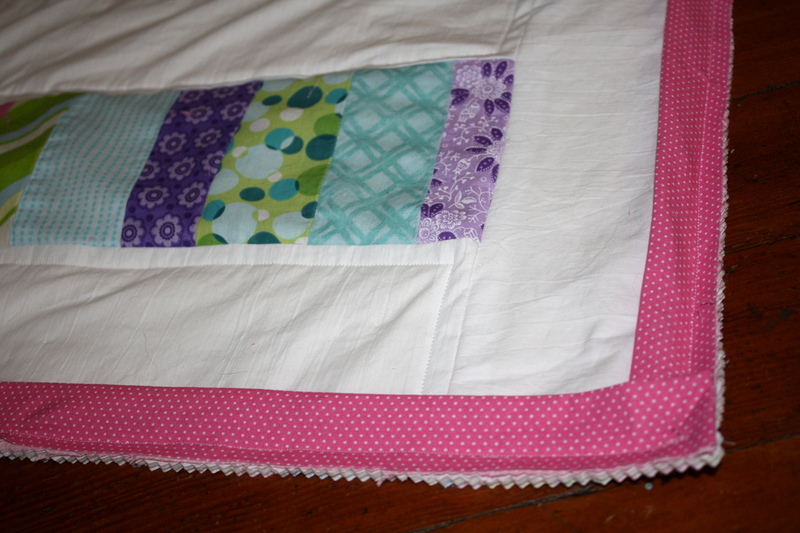 Next I sewed it into place, 1/4 inch in from the edge of the binding strip. And then the back side corner. 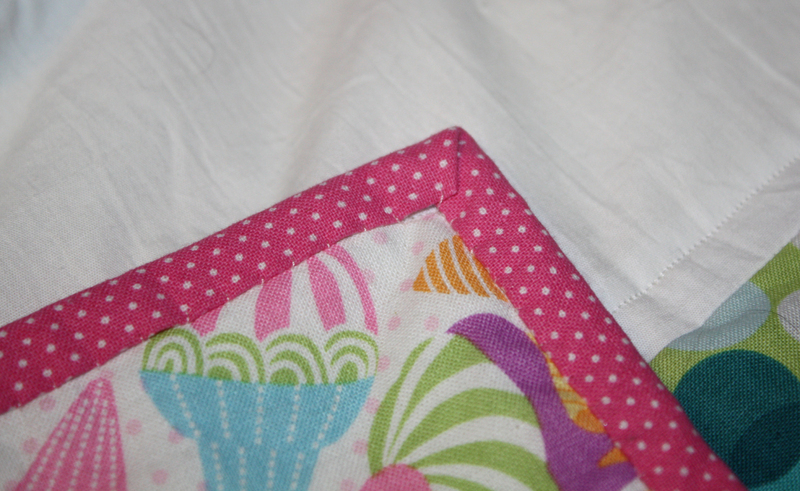 You can also see my hand stitching, not quite invisible but not too bad. 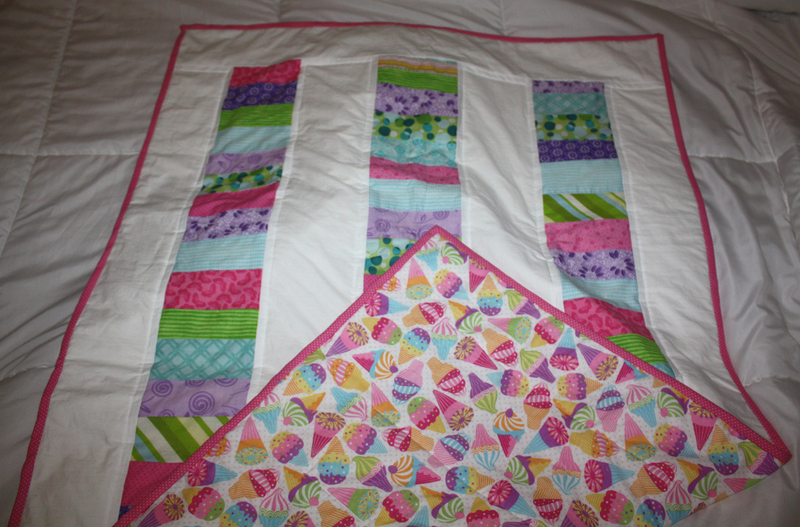 Here's how it finally looked at 1:00 am the night before the baby shower!